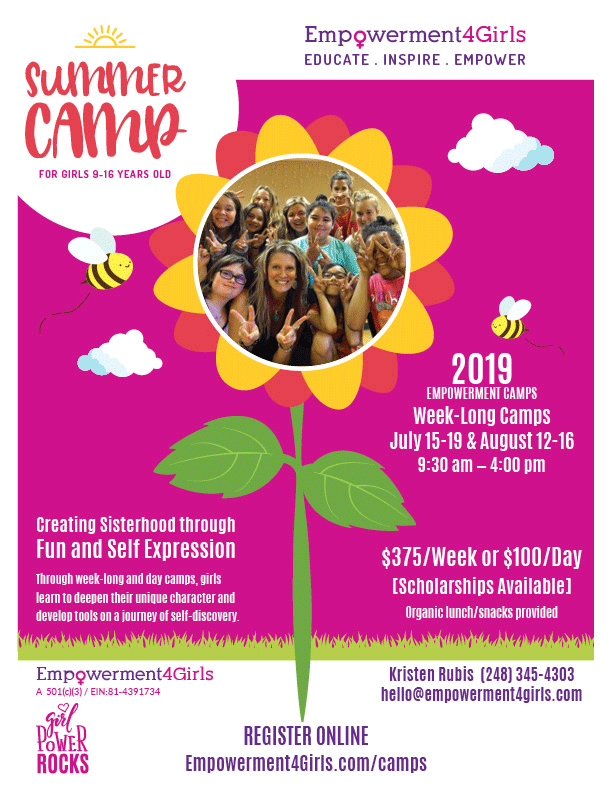 Empowerment Camps educate, inspire and empower girls 9-16 years old, to deepen their unique character, cultivate self-confidence, develop core life skills, and implement daily self-care through an innovative journey towards self-discovery. 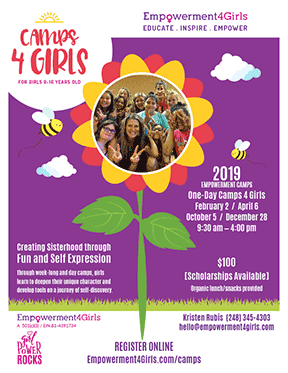 Camps include art projects, yoga, meditation, breathing exercises, dance, positive affirmations, All-About-Me Collages, self-care tools, sound healing, theme-based guest speakers, outdoor activities, and talking circles—creating sisterhood through fun and self-expression. Snacks/lunch included. Did you know that you can sign up for a 1-Day Camp during our Week-Long Camps? Art projects, yoga, meditation, breathing exercises, dance, positive affirmations, All-About-Me Collages, self-care tools, sound healing, theme-based guest speakers, outdoor activities, and talking circles—creating sisterhood through fun and self-expression. Snacks/lunch included. Please complete our Scholarship Questionnaire, with your child, to be considered for a scholarship for one of our Camps, then return to this page and complete your registration. Complete the Camp Registration form on the right. Make your $100 nonrefundable deposit to reserve your space. Pick a date in one of our Week-Long camps that you would like to attend for a 1-Day Camp only. Please take a moment and answer the following questions. Click the (?) for detailed instructions for each question. You will be asked for your payment on the next page after you click Register below. You must pay a $100 nonrefundable deposit to complete your Registration. 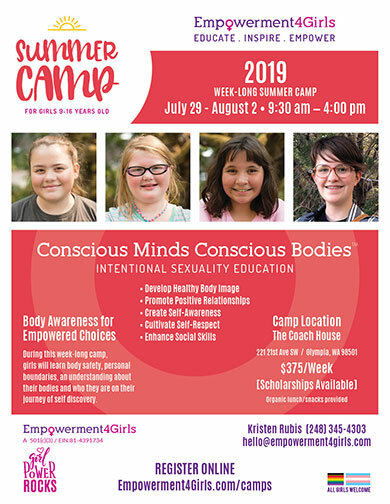 During this week-long camp, girls will learn body safety, personal boundaries, an understanding about their bodies and who they are on their journey of self discovery. Snacks/lunch included. How informed do you believe you are about your physical body (the anatomy of the physical body)? How often do you have conversations with family; friends; educators about your growing/changing body?